After James made a huge move as this week’s HoH on Big Brother 17, the house is in a bit of disarray. This PoV competition is going to be huge! If you missed who was nominated for eviction this week on Big Brother 2015, find out right here! To find out who is playing in this week’s PoV on Big Brother season 17, keep reading my Big Brother 17 spoilers! What do you think this means for the power in the house? Who do you think the winner will save, if anyone? 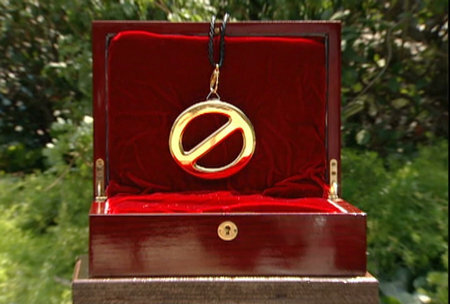 We’ll keep you posted as soon as the Veto Competition happens, which should be sometime today! Join us on Big Big Brother for all your Big Brother 2015 spoilers, news, recaps, previews, pictures and much more! Find us on Twitter and keep up with us on Facebook. Don’t forget Big Brother 17 live feeds for even more Big Brother fun, but uncensored! Every sign up helps support this site to keep bringing you Big Brother 17 spoilers, news and gossip all season long. I think, no matter the comp, that Vanessa and Becky will throw it. The other 4 will be battling it out. Let’s hope for a prize/punishment comp. You know, the one that gives us the “costume” for a hg to wear (Think Nicoles frog costume). And i want Shelli to win it. And have to wear it for a talk with Julie. Not being able to “look her best during camera time” would drive her insane. And i want the last meltdown i see from her to be epic. She’ll need to be tranquilized. So will i. I might be overcome by joy. Oh Cat, you come up with the best ideas – I totally love it!!! What? You don’t think she’ll save Claydoh? hee-hee. Nope. She’ll promise him a new can of Playdoh if she wins. And he gets to pick the color. You think he knows his colors yet? She gave him a chart to study. He’s got black and white down pat. The others…not so much. Cat, you’ too funny, now let’s hope for that prize/punishment comp….. Jackie, James…Fight On! Doesn’t he do that already? 24 hours in solitary confinement. Without mommy Shelli to hold his hand. Cat, do you really think they would do that knowing that either one could be the replacement nominee!?!?. Love the Vanessa Derek comparison. I have thought from the first week that she plays a very similar game. They both lied a lot and spread lies a lot. As soon as they feel threatened, real or not, they try to get the one they fear out. Difference is, Derek was likeable and not vicious. Vanessa is not likeable at all and her lies are vicious. I’ll bet Shelly wins this. She is a huge force in the house. I like her but shes not my favorite to win. If i was in the house i’d be gunning for her definetly, as ibelieve shes the biggest threat. It all comes down to what type of comp it is. And i agree. She’s one to get out NOW and not wait for her to slide through by winning comps. And then getting the power in her hands once again. Then woe be those who experience the wrath of Shelli. Thanks for the update Tammie! I am perplexed ! While I see that Shelli and Clay are ” openly playing as a couple” wow ! How shocking !!! Let’s see ! Who else is playing as a crazy in love obvious couple ? Hum? Oh dear ! It’s idiot Austin or should I say smart Judassss and mean Liz ! Then everyone knows it but acts like they’re not !! But Meg and nasty James !!! The sneaky two that you all know but dont care are Shady Becky and Johnny Mc! All these are couples in forms of different types. But the ultimate couple would be the unshakable twins ! They’d never be torn apart and would always be totally loyal. Yet you’ll want to snarl over chewing up loyal Clay and Shelly. They’ve be silly and loyal to a fault with their alliance. But those nasty two have used them and made it look like they were the ones that set things in motion or wanted it ! When it was Judas or Vanessa every time! Now you’ll want them to pay for the others crimes ?? I don’t get your twisted mentality ! Not liking a person doesn’t warrant setting them up for the others crimes. That’s what happened in or during Hitlers regime. It hurts my heart to see that ! Just like judas and Liz standing there letting crazy Vanessa blame Jason for the phone call vote situation with Jeff ! When it was the 2 of them that did the vote twist ! They knew it wasn’t Jason and let him FRY ! They’re trash! None of you’ll said a negative thing about it! Why !! But you chew on shelli because she cries or make up or make fun of her ! I know it’s a game and we are supposed to have fun fussing about things. But you’ll pick a person. Then turn into vultures picking their bones ! It’s usually because of a relationship. Is it because we’re jealous they’re getting something we’re not ?? How sad. Especially to be calling her is mom ! Their friends and family read all of these things. Granted it’s all fair. But none of you know how you’d react if it were your family member. I’ll bet you’d be a great deal nicer. I know the Bama fan wasn’t raised to speak except with Southern Charm. Mostly because you get people to hear you and cooperate with you much faster or at all if you speak with Southern Charm! Southern Charm is to not be negative and speak with valid points vs making fun of, or whining about something or laughing at or looking down at. Because any of those tend to make the person doing it look small or like a bully that feels inadequate . So they put the person down to feel better or bigger themselves !! Which is so sad ! It’s what you’re seeing with James ! He got power ! Wow ! Both times we need to question it ! Week 1 no one really wants to win HOH and get a target on their back ! So did he really win ??!! Then this week BB built the comp for SHORT people !!!! So judas off then Clay ! You can’t count Steve ! He’s always down first ! But Johnny Mc gave it to James or did he not get that. Shelli made a deal and now JAMES refuses to honor it ! Because Vanessa and Judas whispered in his ear ! As well as vindictive MEG that can’t get through her head it was Vanessa that said No don’t vote for him to stay ! She wanted him up, kept him up ! But it’s all their fault. You’ll agree with Meg! What am I missing ? Their loyalty to Becky , Vanessa ? Darn I know this is long but the mess is so convoluted ! I want to grasp what the reason is for the convicts being set free and those they set-up going to jail being enemies of the entire world ??? As for calling Shelli, Clay’s mommy…….HE was the one that asked her if he could call her that. That’s rather pathetic coming from a 23 year old man that’s trying to make time with a 33 year old woman. As for Shelli, she only cries when she doesn’t get her way. And repeatedly insists that her and (name any hg) not have an important convo until she has her makeup on. She knows it will be viewed by feedsters and the CBS only crowd. How very vain. Then we can add how entitled her and Clay are. And smug because they were running the show until the peons staged a coup. As for Shelli making a deal with James and him going back on it……Good. My suggestion for her would be to revisit season 6 and ask Kaysar how making a deal went for him. what do you expect Judas to do when it’s him or Jason. I’d throw him to the wolves to save my game. But i agree about Liz/Julia. The only real blood bond and it needs to be exterminated. “Not liking a person doesn’t warrant setting them up for the others crimes. That’s what happened in or during Hitlers regime.” – those are your words. Within the confines of the game, not liking a person is INDEED cause for setting them up for not only their crimes but others as well. It’s all part and parcel of playing the game like you want to win. What are you going to do?….wait until that person you don’t like (and who probably doesn’t like you any better) targets you for eviction? I think not. You MUST make a preemptive strike. Or you’re waiting around until your number is called like sheeple. And those convicts you speak of being freed…..not likely. A power move by ANYONE is going to reap payback of some sort. And don’t you think it a bit ridiculous to equate a game about lying and deception to Hitler? That’s real life man!…not a game. Every single hg is in it to win it. If not, they shouldn’t be there. And if they don’t take every opportunity to rid the house of a threat (whether real or imagined), they are dense. I love this game. And i look forward every year to discussing the hgs. Both the good and the bad. I choose who i like, and others do the same. If hgs are worried about nasty comments or how their family will cope….then they shouldn’t be on a national network show. Because EVERYONE knows they will be fodder for conversations that pick them apart (their quirks as well as their game). And last but not least….I really like that Bama fan. Actually, Jake, you don’t have to agree with anyone here to be welcome. But maybe you can ACT more southern and be a bit less disrespectful in the future. I think it is a bit strange that Jackie and Meg get chosen to play the veto comp. Seeings how they are on James side. Wonder if production has something to do with it, to make it more interesting. Just saying. The PoV players are, James – HOH, Shelli and Clay – the nominee, Jackie, Becky and Vanessa – randomly picked. I want Shelli to shave her head.